As the voltage on channel 12 is varied from 0 to 3.3 - the ADC reading on channel 14 varies proportionally totaling 4%. With Chold fully discharge, there *shouldn't* be any cross coupling despite the 'high' impedance of the source. Did I misunderstand the model, is the datasheet inaccurate, or some 3rd thing? This circuit has low *impedance* as required - DC impedance is high, but AC impedance is low. Sample rate is low enough for the 390pF to fully recharge. Based on the analog input model the expected error due to the source impedance is 1.3% +-0.7%. How are you fully discharging CHold? You would have to leave CHold connected to Vss for long enough to accomplish this, perhaps you are not meeting the time requirement? Forgot to ask. If you make it sample multiple times (like 10x) after the channel switch on the new channel, do you see the value improve from sample to sample? If it does this is a sure sign that you have a residual DC voltage on the CHold cap which needs to be removed OR you need to increase the sample charge time (acquisition time) to reduce the coupling. Might be you do not understand how an ADC is working, might be there's another issue. The system's purpose is a battery charger so Vout is expected to be connected to a battery, however - in the absence power elsewhere in the, power is consumed at Vout to run the system. That is the present state. Vout and Vin are the input and output to a sync buck converter (bidirectional so actually a buck or boost in reverse), these AN channel are the voltage sense signals. During this testing, a timer is generating timing for ADCs, but the half bridges are off. Vout is connect to a power supply (for stiffness) and Vin is a diode drop lower due to the half-bridge body diode. Both Vout and Vin have >10uF of ceramics and >3300uF of electrolytic capacitance. The first capture, both POTs are set to ~0V. In the second capture POT1 is set to 3.3V, POT2 is unchanged. The DC voltage of the AN4 and AN14 is about 1.15V. The delta V that occurs when the ADC sample occurs is ~ -50mV or +100mV. If we assume that Chold isn't discharged, and that Chold is the voltage of the POT, then delta V should allow one to calculate Chold. Based on this, and my crude delta V estimates, Chold is 390pF/23 or 390/21.5 or around 17pF. Obviously a lot larger than the model states. Of course the model also states that Chold is discharged between samples. Also failed to mention my sample and hold time. My ADC clock is 70 Mhz, and for these scope captures sample time was 50 clocks or 700nS. Typically I run SH of 10 clocks - but was experiment with the value to see if it had an effect - it doesn't. You should start with DC-coupling the channels! Do I interpret the plots correctly when assuming 50 µs/DIV? And you ignore the statement in the DS section about the source resistance being <= 5 KOhms. This is NOT about "AC resistance" - this is about plain DC resistance! And a reasonable value for some "buffer" capacitance is more like 1 nF and beyond (10 nF might be fine) - not 390 fancy pF ! What do you mean - "DC coupling the channels"? Yes 50uS / div. Didn't ignore the statement - I think its only about Cpin - which is a 1 or a few pF. Cpin is in parallel with the 390. But the question is - is Chold being discharged between samples? Is it supposed to be? How do you determine Chold is not discharged ? How do you imagine the ADC sampling might work if Chold was not discharged ? The 5 kOhms is not about CPin (which is more a nuissance than helpful), it's about the SOURCE RESISTANCE - the resistance of YOUR source! And from the voltage curve I can tell that your time constant of 17.5 µs somewhat holds - as it takes about 50 µs to replenish the charge "drawn" by CHold. CPIN is negligible if Rs <= 5 k."
Are we talking about Note 1? Okay so Cpin isn't negligible in my application - I didn't neglect it. Cpin is in parallel with 390pF and thus adds to it. The question started with a guess last night - but with the new data I've collected - I have my answer. The blips in the voltage in the scope traces are what I call deltaV - but Chold would need to be about 16pF to explain the delta V.
2) Chold isn't ~5 pF as stated in the DS. In anycase, there is definarly cross coupling as the voltage on the previous sampled channels effects the deltaV of my high DC impedance circuit. Have all your measurements been made at the same adc sample rate ? Do they change if the adc sample rate is lowered ? !!! OMG !!! What an ignorant! I p.. on your capacitance (too small to be significant) - it's the source (series) resistance that counts! I won't repeat this another time. What I repeat: What is your source resistance ? Your curves are clearly showing voltage transistions during sampling (recovery takes 50 µs) - the result of a too-high source resistance. Does this - ever-so-slowly - settle now? "In new devices the SAR core was updated, however, there were some details not correctly reflected in the data sheet. The Chold capacitor is 2.4pF (see “input_circuit.png” in attachment). This capacitor is NOT discharged after the end of conversion. To avoid a cross coupling, the sampling time should be big enough. However, it may not be possible to achieve if one channel in the scan list has a high impedance source and requires additional sampling time. We have made note of the need for this documentation to be corrected, but hopefully that answers your question for now. If you have any further questions, just let me know, and I will get back to you as soon as I can. Otherwise, feel free to close the case." "My colleague hadn't gotten around to the issue, sorry, but we are very busy here now. This morning he was able to verify your calculation, the Chold is coming out to be 18.6 pF. With that information, my colleague is working with the design team to further clarify the operational behavior." The other channels are instead a filter + attenuator that goes into a final buffer made with a MCP600x. a 220R resistor from OPA output to ANx pin (Also changed with 100R but that didn't change the shape or the duration of the noise erroneous pulse. CH3: ADC Input, before and after the resistor (Again, 220R or 100R or even a short won't change the pulse shape. Pulse was acquired with proper probing) so the pulse is at the output of the MCP600x buffer, but is not at the + input, as it's too fast to propagate along the slow MCP. the previous AN channel was grounded so you see the pulses that tends to go to gnd. While i'm writing this i'm wondering if a faster OPAMP would be able to eliminate the pulse.. It's not required by the application but it's still annoying to see. I am not sure of the bandwidth requirements of the input other than Nyquist limitation due to your 10kHz sample rate, but your scope shot seems to show ~20Hz sine wave. Can you do something relatively simple and add, say, a 100R resistor to the opamp output for isolation, plus, say, a 100nF tank cap on the ADC pin? 1 MHz GBW for the MCP600x is not really much. One of the issues is buffer bandwidth, another one the buffer's drive strength. 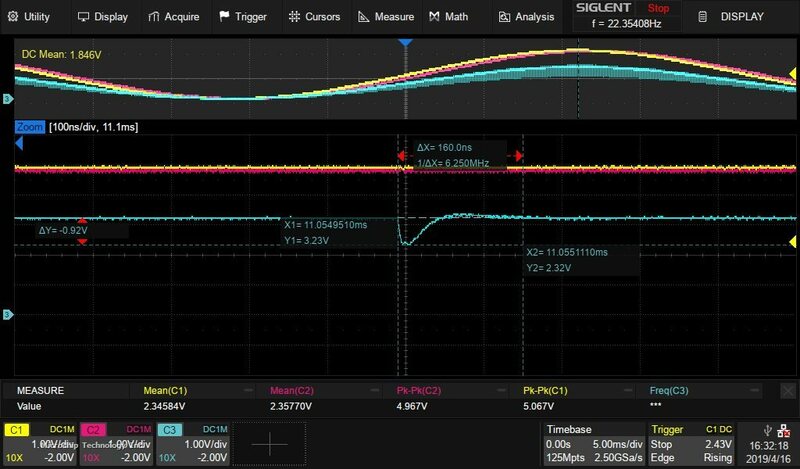 The slew rate might be an indication for the drive strength, and 0.6 V/µs is way from 1 MHz GBW for more than (really) "small signal bandwidth". Thus, a faster OpAmp with a significantly higher slew rate (I'd recommend something equal or beyond 5 V/µs) is expected to yield better results. You've already implemented the cheapest way to improve the signal: adding a reasonable capacitor (2- to 3-digit nFs should be a viable approach). Unless this capacitor does slow-down your input too much, this should be feasible. 6 .. 23 mA short circuit current (depending on the supply) is poor. Look for a "non-low-power" buffer or OpAmp: drive strength is associated to quiescent current: low quiescent current => low(er) drive strength.